PHOENIX — After soaking northwestern Mexico with heavy rains as it neared the Baja California Peninsula, reportedly claiming at least one victim, Tropical Storm Rosa is expected to drench the U.S. Southwest. The center of Rosa, which was a hurricane until late Sept. 30, is expected to hit Baja California and Sonora by early Oct. 2, bringing 3 to 6 inches of rain, the U.S. National Hurricane Center said. It’s then expected to move quickly northwestward as it weakens, bringing 2 to 4 inches of rain to central and southern Arizona and 1 to 2 inches to the rest of the desert Southwest, Central Rockies and Great Basin. Isolated areas might see even more precipitation. 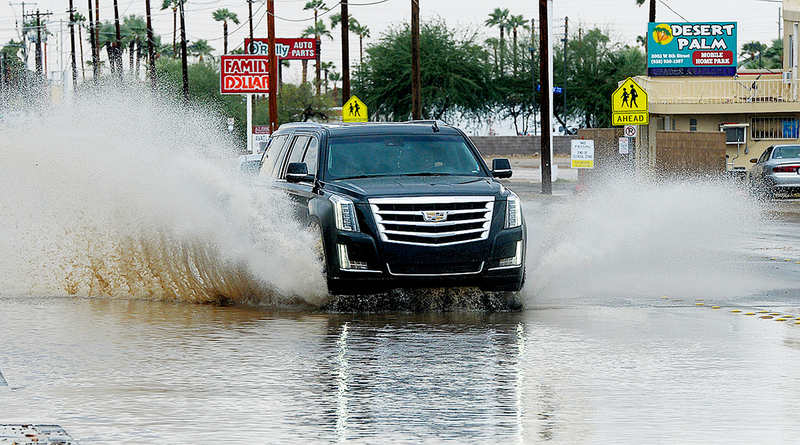 In southern Arizona, heavy rain Oct. 1 flooded streets in Yuma and caused power outages in parts of the city. At least six roads in Tucson were closed because of flash flooding from washes that overflowed. The Utah National Guard was activated Oct. 1 to assist in flood mitigation efforts in Utah County. The National Weather Service earlier announced flash flood watches through Oct. 3 for areas including southern Nevada, southeastern California, southwestern and central Utah and the western two-thirds of Arizona. National Weather Service meteorologists in Phoenix said central and northern Arizona stood to get hit with the heaviest amounts of precipitation. Metropolitan Phoenix, where temperatures were above 100 degrees Fahrenheit only a few days ago, had already cooled to the 80s on Oct. 1 thanks to Rosa. Moisture associated with the storm arrived ahead of it, bringing rain the night of Sept. 30 to the morning of Oct. 1. Phoenix meteorologist Jaret Rogers said more showers were expected across central Arizona before a weakened Rosa is to arrive in the area on Oct. 2 during the morning. According to the National Weather Service, the entire Phoenix area is expected to see between 1 and 2 inches of rain. But some areas could see between 2 to 3 inches. Rosa’s maximum sustained winds had decreased to 40 mph as of Oct. 1 afternoon, and the storm’s center was heading north-northeast at 10 mph. The Civil Defense agency for Baja California state said schools were closed Oct. 1 in several communities, including the state capital of Mexicali, across the border from Calexico, Calif.; San Felipe, on the northern Sea of Cortez; and south of Ensenada, on the peninsula’s Pacific coast. Federal authorities declared a state of emergency for Ensenada and Mexicali. Various Mexican media outlets reported that a woman was swept away by floodwaters and drowned in the city of Caborca, Sonora, on the Sea of Cortez.